Try our 30-day plan designed to build a super set of six-pack abs to the letter, and we promise you’ll be surprised at the results. The first two weeks of this program will help you develop a strong central core and abdominals. With a solid foundation in place, you’ll spend the following weeks adding muscle strength and definition. To get maximum results, be sure to include resistance and cardio exercises for the rest of the body. And remember: No diet or exercise program can target just belly fat; you must reduce your overall body fat. Getting that lean, chiseled look takes a combination of a diet of fat-burning foods and exercises that target the central core muscles. If you’ve never done a crunch in your life, use these exercises to tone up your central core. Perform four sets of 10 reps for each exercise except the elbow plank. For the elbow plank, hold it for 30 seconds, then rest for 10 seconds. Perform this abs workout every day for seven days. Three times during the week, add another 30 to 45 minutes of a full-body workout. Grip a 15 lb dumbbell in each hand and let your arms hang down by your side. Bend sideways at the waist as far as you can, letting the dumbbell slide down along your outer thigh, then straighten back up. Rest on your right elbow, hip and leg, and bend both knees. Your body should be sideways to the floor, with your knees and feet together. Lift your right hip off the floor using your core and glute muscles. Push both hips upward and forward as far as they can go, then lower your hips to the floor. Keep your knees together throughout the movement. Repeat 10 times for one set, then switch sides. Grip a single 15 lb or 20 lb dumbbell by holding one bell end in each hand and extend your arms out straight. Twist at the waist, bringing the dumbbell down towards the floor on your left. Bend your knees slightly to get a good twist. Use the dumbbell to trace a diagonal line upward and in front of your body. Finish by standing tall with the dumbbell overhead and to your right. Keep your arms fully extended throughout the movement and follow the dumbbell with your head. Bring the dumbbell back down towards the floor and to your left. Repeat 10 times, then switch sides. Get into a plank position on the floor, resting on your elbows and balls of your feet. Adjust the height of your hips to create a nice straight “plank” with your back and legs. Contract your abdominal muscles as hard as you can and hold this position for 30 seconds. Relax and rest for 10 seconds, then repeat four more times. For the next seven days, up the intensity of your daily abs workout by increasing the number of reps. Perform four sets of 20 reps for each exercise except the elbow plank. Increase the hold of your elbow plank to 60 seconds, keeping the rest time at 10 seconds. Bump your additional full body workout component to five days this week. Next it is time to focus on strengthening the abdominal muscles in your central core. For this week’s daily abs workout, perform four sets of 20 reps per exercise. Continue to add 30 to 45 minutes of full-body resistance and cardio exercises at least five days this week. Get into a floor plank position with your hands on the floor and upper shins resting on a physio or stability ball. The larger the ball size, the lower the intensity of this exercise. Use your abdominal muscles to pull both knees up towards your chest into a tucked position, then extend both legs back into a plank position. Get into a plank position with your elbows on a physio ball. Maintaining a strong plank, “stir” your elbows three times clockwise, then three times counterclockwise. Keep your core and glute muscles engaged throughout the movement. Don’t let your hips or shoulders sway or bob. Get into a floor plank position with your hands and the balls of your feet resting on the floor. Maintaining a plank position, slowly pull your right knee up to your chest, then extend your foot back to the floor. Switch sides, bringing your left knee up and back down. Remember to keep the cadence slow—the count is 1-2-3 up, 1-2-3 down. Get into a floor plank position resting on your hands and the balls of your feet. Bend your right arm and lower yourself onto your right elbow. Then bend your left arm and lower yourself until you are resting on both elbows. Straighten your right arm, then your left arm, until you are back into a plank position resting on your hands. Switch sides, bending your left arm first, then right arm, and straightening your left arm, then right arm. 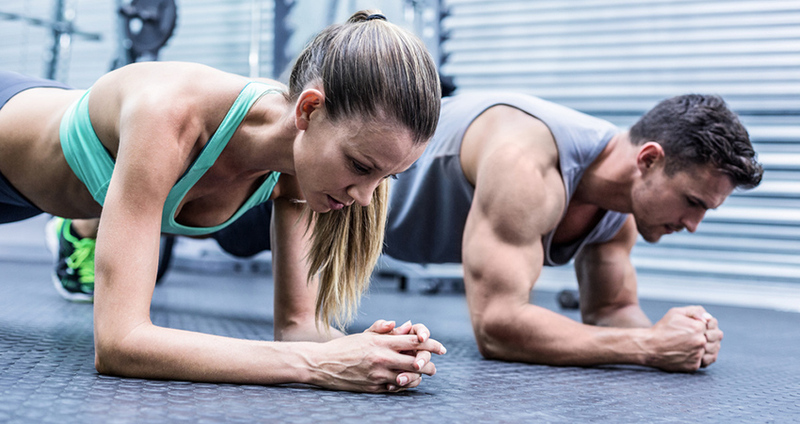 Maintain a strong plank position throughout the movement, keeping your core and glutes engaged and your back straight. This daily abs workout is designed to build muscle definition, the finishing touch to your 30-day program. At this point your midsection should feel rock solid and look very lean. If you are not where you need to be, make sure you are on track with your diet, as well as your overall exercise levels. Your daily workout should include at least 30 minutes of full body exercises in addition to the abs routine. Perform four sets of 20 reps for each exercise. 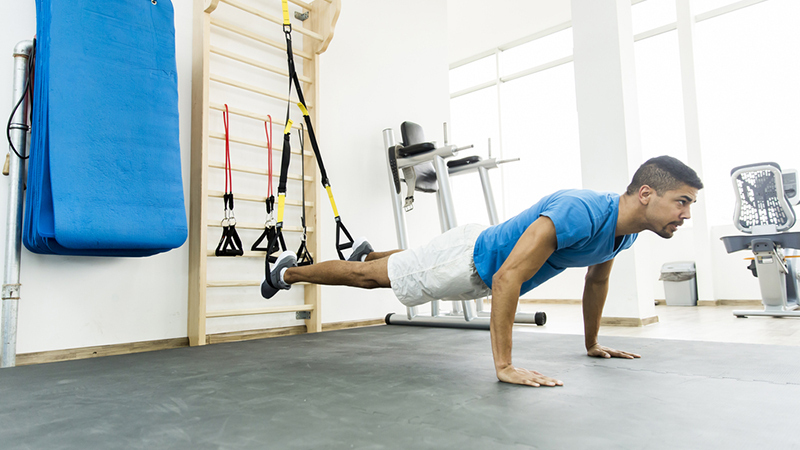 Suspend both feet in the loops of a TRX suspension trainer and get into a plank position with your hands on the floor. As you drop into a pushup, bend your right knee and bring it up toward your right elbow. Straighten your arms and extend your right leg back into a plank. Engage your core and glute muscles, and do not allow your body to sway from side to side. Switch to a smaller size physio ball to increase the intensity of this exercise. Or suspend your feet in the loops of a TRX suspension trainer. Switch to a smaller size physio ball. Instead of circles, use your elbows to trace the letters of the alphabet. Lie on your back with your arms on the floor and your legs extended perpendicular to the floor. Your body viewed the side should look like a right angle, or an “L”. Keep your arms and upper back on the floor, slowly lift your hips off the floor as high as possible. Slowly lower your hips to the floor. Do not use momentum to lift your hips. Raise your feet straight up at the ceiling and do not let them swing toward your head.